Please ask about our Gratitude Discounts for eligible personnel when enquiring about China Hire. Whether you are looking for vintage pillowcases or sheets, china or glassware, lace or other haberdashery or almost any household accessories to help make your home authentically vintage, we hope that you find what you are looking for here. If not, please feel free to contact us, we may be able to source your requirements. Tip: Many vintage embroidered and lace edged single flat sheets are wide enough to be used under a quilt cover on a modern double bed. The single sheet pictured here is 68 inches wide by 100 inches long. 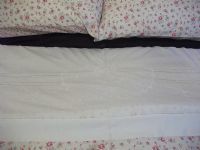 It fits snugly underneath a Laura Ashley quilt cover folding back beautifully to reveal the stunning quality of the vintage embroidery with an overhang at each side as deep as the mattress (but will not tuck in). This gives a modern bed a luxurious vintage look and feel whilst at the same time saving you from having to wash the quilt cover quite so often!